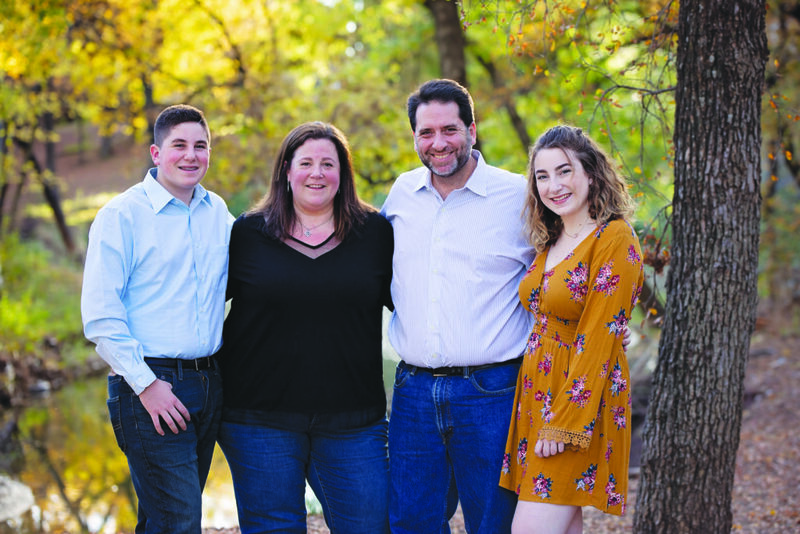 Debbie and Manuel Rajunov, center, with their children Josh and Abby, will be honored at Congregation Anshai Torah’s Diamonds and Dice event on Dec. 8. Congregation Anshai Torah will play to a full house at its 2018 Diamonds & Dice casino night, honoring Debbie and Manuel Rajunov. The community is invited to an evening of games and fun, music and merriment, of heavy hors d’oeuvres and an open bar from 8 to 11:30 p.m. Saturday, Dec. 8. Co-chairs Jennifer Hersh, Kimberly Mabel and Eric Olschwanger are joined by Jackie Austein, Beth Berk, Cynthia Brooks, Debbie Cohn, Gretchen Edwards, Shawn Frank, Amy Gross, Marcy Kahn, Matt Kurtzman, Shana Staub, Harvey Swento, Brad Welcher and Kim Velevis in creating the spirited night of Vegas chic. A silent auction will feature jewelry, sporting and entertainment event tickets, pampering opportunities, gifts and more. The Rajunovs, Anshai Torah members for 15 years, help coordinate and lead programs and events, and offer support regularly and devotedly. Debbie is the daughter of Sabra parents Gideon and Ilana Kishony, and the sister of David, Karen and Ron. A New York native who was raised in Schaumburg, Illinois, Debbie attended religious school and was a member of the youth group at her family’s Beth Tikvah Congregation. A graduate of the University of Wisconsin-Milwaukee, with bachelor’s and master’s degrees in architecture, Debbie is a member of Anshai Torah’s board of directors and co-chair of its Religious School Committee. Manuel, the son of Ana and Fermin and brother of David and Vicky, was born in Mexico City and spent his formative years living on the Tijuana/San Diego border area. His commitment to Jewish life and Israel began early as he attended religious school four days a week and was a member and leader of the local chapter of Maccabi, a Zionist organization. He has been to Israel 16 times in the past six years for business, personal reasons and on educational missions. Manuel is an attorney with Greenberg Traurig, LLP, the only international law firm to have an established office in Israel. His practice focuses on tax consulting and transactional advice to foreign investors doing business in Mexico and advising Mexican investors on their investments overseas. His special emphasis is on real estate, corporate and securities, as well as mergers and acquisitions. “It’s important that we educate our community about Israel, and I’m proud Anshai Torah makes that a priority, not only by hosting world-renowned scholars, but also by leading a large delegation to AIPAC’s annual Policy Conference,” said Manuel, a leader in CAT’s Israel education and advocacy programming. The couple, who met while she was based in Chicago and he was working there temporarily, married in 1999. A job opportunity moved Manuel to the Metroplex, and it became home. As they began their family, it was important to the couple to find a congregation: a Jewish connection and a community with which to surround themselves. In Anshai Torah, they found all of that and more. The two have set the example as strongly identified and committed Jews for their children, Abby and Josh, who as teenagers are now involved in Anshai Torah’s DeReKH Hebrew High and youth programs. For tickets ($75 each) or sponsorships to Diamonds and Dice, call 972-473-7718, email receptionist@anshaitorah.org or visit anshaitorah.org. on behalf of Anshai Torah.